The big talking point in Danno's has to be the food - proprietor, chef and local character Danno O'Keeffe. Danno is known far and wide for his delicious, honest, home-cooked food. You will find local produce at its very best - from home-made burgers cooked to order on the grill to traditional Fish and Chips (made using fresh fish off the boats nearby at Dingle Pier). Danno's one of Dingle's favourite place to host functions and events - Danno breaks out the BBQ Grill, in their outdoor beer garden (which also has an enclosed area if the weather is less than favourable) cooking burgers to order while guests enjoy the atmosphere and perhaps a drink or two. Engagements, birthdays, wedding after-parties, sporting socials, you name it, Danno has hosted it. "serving a range of quality food direct from the fishing fleet and the farms of Dingle"
To start why not choose the Dingle Bay Seafood Chowder or the Home-Made Soup? All the ingredients used are seasonal these provides a real taste of Dingle and West Kerry. Delicious Home-Made Chicken Goujons are also available to enjoy. Slow Roasted Smoked Salmon, Fresh Dingle Bay Prawn Salad and Dingle Bay Crabmeat Salad pays homage to the area’s proximity to the Atlantic Ocean - if you think you know seafood, think again. There is nothing quite like fresh fish off the boat and Danno has the experience and no-how to really bring flavours to life. Danno’s of Dingle is famous for its beef burgers - these are packed to the brim with the best West Kerry beef and cooked to order by Danno himself on the old-style grill in whatever way you would like - medium, well-done, rare, its up to you. The Regular Burger is anything but ‘regular’ - 6oz, juicy and delicious, it really is a treat. Other variations such as the Creole Burger with Hot and Spicy Sauce or the Cheese and Bacon Burger speak for themselves. The 6oz Sirloin Steak Sandwich is a must for all meat lovers and all of these delicious delights are served with a choice of home-fries, baked potato or salad. A wonderful array of fish dishes, with a taste unique to the shores of Dingle Bay, present tempting choices in Danno’s; Steamed Dingle Bay Mussels served in a delicious White Wine and Garlic Cream Sauce have to be tried to be believed. With the sea only a stone-throws’ away, it doesn’t get better than this. Danno also serves up an array of seafood creations such as Prawn Pasta, Deep Fried Dingle Bay Prawn Scampi or house favourite, Traditional Fish and Chips which are sure to satisfy the taste-buds. Lighter bites such as a selection of freshly made sandwiches, BLTs, Tuna Melts and open sandwiches on home-made brown bread topped with fresh crabmeat and salmon add to the delights that await you. A pot of freshly brewed coffee and Irish Tea may also be enjoyed with warm Home-Made Apple Pie, Ice-Cream, or their secret recipe Chocolate Biscuit Cake served with fresh cream. 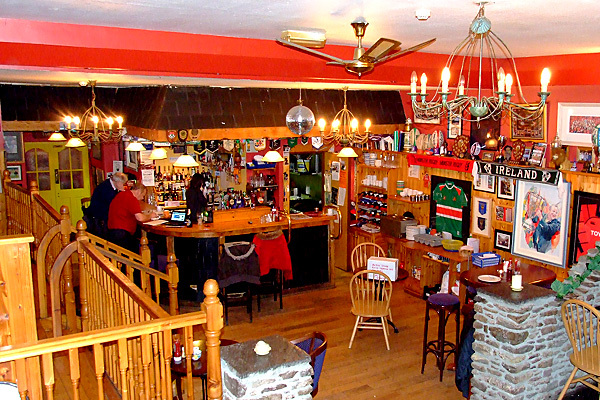 Danno’s Restaurant & Bar is also the home of Rugby in West Kerry - it is not unusual to happen upon a member of the Munster Squad or an Irish rugby legend such as Mick Galwey sitting at the bar enjoying a pint. 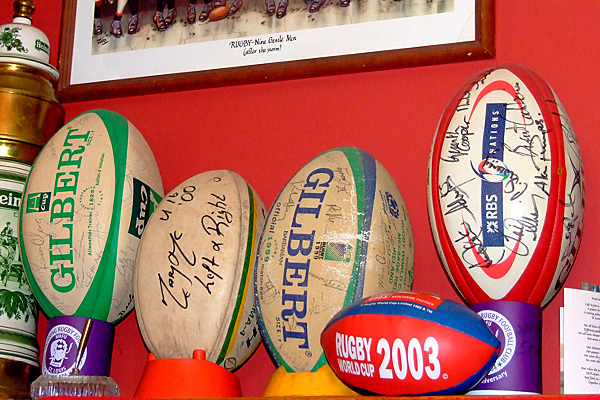 West Kerry rugby team Rugbai Chorca Dhuibhne host a lot of their events here midst the beautifully appointed stone and wood bar and restaurant which is filled rugby memorabilia which is sure to interest any sports fan. Danno’s Restaurant & Bar is also one of Dingle’s favourite place to host functions and events - Danno breaks out the BBQ Grill, in their outdoor beer garden (which also has an enclosed area if the weather is less than favourable) cooking burgers to order while guests enjoy the atmosphere and perhaps a drink or two. 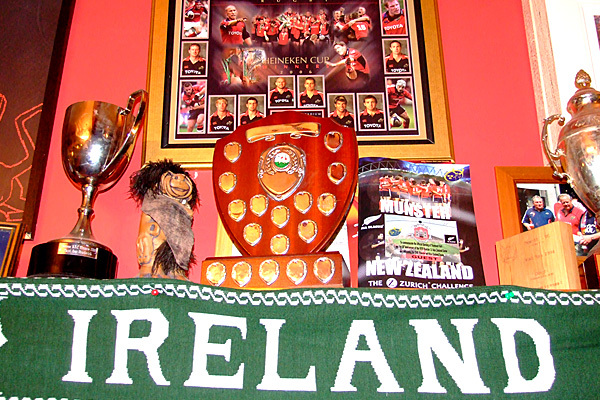 Engagements, birthdays, wedding after-parties, sporting socials, you name it, Danno has hosted it.